Somethings will just NEVER go out of style. The need for a great doctor, a great lawyer, a skilled and honest mechanic, a great meal at a fine restaurant, and the one thing that all of those have in common that defines them… GREAT SERVICE! Whether it was 100 years ago or yesterday, people will willingly and happily pay a premium for great service. With that said, they will just as willingly and happily discount the absence of or even the perception of the absence of great service. The one thing about great service is that the ONLY person who could decide if the service being provided is truly great is the person receiving it. And this is where the breakdown begins and ends and exactly why great service has become something many talk about but rarely actually deliver. For this reason, some customers have just decided that it’s easier to find someone who will be cheaper vs spending so much time searching for truly great service. Conversely there are many “service” providers who have decided that it’s easier to just reduce their fees than to pursue actually delivering great service. This is as simple as supply and demand. There is a demand for cheap and there are those who are happy to meet that demand. But common sense dictates that there is a demand for premium service and the existence of those who will meet that demand as well. I’ve dedicated my career to delivering world class service. Whether as an Air Traffic Controller responsible for providing safe travels to aircraft where less than world class service can be deadly, or as a real estate professional tasked with representing home sellers and buyers in the largest transaction of their lives. An almost obsessive dedication to delivering extraordinary service has been at the core of my success. While so many are focused on how much money they’re making or winning awards, I’ve simply focused on delivering great service to those I serve. As a result, I’ve not had to spend as much time justifying my value to people. No, I’m not bragging. I’ve just found that as professionals, we all have the opportunity to choose how we conduct ourselves in our businesses. If we constantly strive to be the best at our profession, seek knowledge, improve, and relentlessly focus on delivering incredible service to our customers, then we will be paid accordingly. If we constantly look for shortcuts, let our egos get in the way, meet our customers expectations rather than exceed them, spend little time working on improving our knowledge, and make excuses, then once again, we will be paid accordingly. So, the first thing you need to decide is whether you are going to be the BEST or the SAME AS EVERYONE ELSE or just the CHEAPEST. If you decide to be the BEST in your profession, then you’re going to have to really work hard at it. This means that you are focusing on going above and beyond ALL the time, not some of the time, ALL of the time. I put together a list of some of the ways that you can stand out as a real estate agent in today’s market and literally blow your clients away in comparison to what they’ll get from the average agent out there. -Stop or at least dramatically reduce the amount of texting and emails and start actually calling people or meeting face to face with your clients more. -As a listing agent, require that buyers agents present their offers in person to your sellers with you there of course. In multiple offer situations, have them all show up at the same time and show your seller what a great negotiator you are. -Physically BE at every inspection, appraisal, and walk thru appointment. While other agents are “too busy” or “too important” to be there, you raise the bar and be there. Selling or buying a home is very stressful and scary for many, and your presence shows that you are there for them and representing their best interests. -Answer or respond to ALL availability calls from buyers agents. These calls allow you the opportunity to SELL the home to the agent and provide them with solid positive talking points with their buyers while setting up expectations and instilling confidence in your professionalism as a listing agent. -Communicate often, answer your phone, and respond to messages fast. -ALWAYS remain calm and professional regardless of the co-op agent/client behavior. -Demand and deliver the highest quality in every aspect of the marketing of the home. No detail is too small. No shortcuts. -ALWAYS check lock box showings and call showing agents prior to countering or accepting an offer to ensure no other offers are coming in. Do this to encourage more offers too. -As a listing agent, recognize that your job is not just to sell the home, but to sell the home for top dollar. And one of the best ways to accomplish this is with multiple offers. So encourage ALL offers. Contingencies, low offers, etc. -Whenever possible, be at every showing as the listing agent. Don’t depend on a buyers agent to adequately “sell” your listing and all of it’s benefits and features. -Become an expert at articulating your value and your company’s value. Don’t “wing it” on listing presentations. The clients deserve to know what they are paying for so tell them. -Always go out of your way to help your sellers find their next home. Whether referring out of the area, or helping find a rental, you need to be part of this solution for them. -Ask lots of questions to get to know and fully understand your clients situation and primary goals and objectives. Don’t try to guess at this. Talk less and listen more. -Be CONFIDENT but not ARROGANT. Even the slightest perception of arrogance can be deadly. -Have EMPATHY. Put yourself mentally in their situation so you can understand what they are going through better and genuinely CARE. -“100/0” —Accept 100% responsibility and make ZERO excuses during the entire transaction. Never blame others. -Be an expert on the market. Knowledge is power and your clients expect you to have it. They would almost always prefer facts over opinions. These just a few things that you can do to stand out in today’s market place. While some of them may not be very convenient and could be difficult to accomplish, the alternative is compromising your service and standards. And as I eluded to earlier, this is a slippery slope and a one way ticket to mediocrity. Thank you for taking the time to read this and don’t forget to SUBSCRIBE above! Chicken Little said it and it’s become a great analogy for the perpetual fear and panic that has spread throughout the Real Estate industry since long before I got my license almost 25 years ago. Since I got into this business, I’ve heard the panic almost every single year. Whether it was the “Banks are going to take over”, “Internet is going to replace us”, or the seasonal discount broker that shows up with plans to “disrupt the industry”, so far, none of these things have managed to replace the skilled customer service oriented full service real estate agent and firm. With that said, this is NOT a post about other business models, and it’s certainly not a post designed to discredit or discourage the entrepreneurial spirit and competitive nature of our business or any business for that matter. Over the years I have seen many businesses succeed and fail but I have always appreciated how these business attempts either prove me wrong or validate my beliefs. So what is this post really about? It’s about VALUE vs COST! Most of the attacks on the full service brokerage model have been almost 100% focused on attacking the COST rather than the value of a real estate agent/firm. Oh yes… They try to diminish the value of the competitor by implying that they are overcharging for what they offer, but in the end, all that’s being sold is COST. Sometimes it’s because the market shifts up or down that drives the emergence of these COST focused businesses, but whatever the reason, the common sense is that no matter what business it is, there will always be a large majority of people who demand VALUE over COST. IF cost was all that mattered to the general public then expensive doctors, lawyers, engineers, and frankly every luxury auto maker would disappear in light a cheaper/less expensive option. Think of any business, service, or product… There is a low cost version and a high cost version and in every single case there are significant differences in their offerings/products. It really is about common sense. An entire industry like the real estate business would not be dominated by full service brokerages if there was such a demand for low cost/discount brokerages. It’s not like real estate or real estate agents are something new. And regardless of whether it is a company like Zillow offering “Instant Offers”, Discount Brokers, or a Tech Company wanting to automate the entire transaction on an APP or website, the ONE business model that has been sustainable and withstood the test of time has been the FULL SERVICE REAL ESTATE BROKERAGE model. The fear surrounding the “instant offers” offering by Zillow is not worth the drama either. Almost every home seller wants TOP DOLLAR for their home so those few who don’t, are willing to sell “under market” to an investor, and that is NOT the Full Service brokerage customers. So Zillow is welcome to do what they want but until they figure out how to replicate what the Full Service brokers offer and deliver on, they aren’t really our competition. I’d even venture to say that since Zillows model is to sell leads to real estate agents, that their “instant offers” program is likely a ploy to gather seller leads to sell back to the real estate agents at a premium… Sound familiar??? So the bottom line is this… IN THE ABSENCE OF VALUE OR EVEN PERCEIVED VALUE, PEOPLE WILL SEEK OUT COST. And overall, our industry has done a great job not only proving that we are worth our fees, but we have demonstrated it in our overall results over a very long period of time. Selling a home is NOT easy, and closing the escrow is even harder in many cases. The amount of skill, patience, strategy, & experience it takes to get through most transactions is staggering. In most cases, there are more things that could go wrong than could go right and it takes incredible insight, anticipation, and problem solving abilities to get these transactions closed. Furthermore, the amount and quality of marketing, advertising, and over all exposure necessary to drive the demand to achieve the top dollar price cannot just be duplicated by anyone. Some brokerages and agents simply do more than others and some do it better. This is an unarguable and easily proven fact. So who do these other business models have any success at all? They literally bank on not having to compete with the top brokerages and agents in a competitive listing presentation. They often count on a seller just seeing a lower COST and assuming we’re all the same and calling them. Or they hope that a seller is so focused on saving money on real estate commissions that they don’t apply their normal way of considering VALUE in every other aspect of their life to this huge decision to sell their home. And lastly, they hope that if they do end up competing with a full service real estate agent that he/she will not be skilled enough to articulate their value proposition and justify their fee, leaving the decision to COST where they can always win. What’s my advice to the full service real estate agents out there? BECOME EXPERTS AT KNOWING YOUR AND YOUR COMPANY’S VALUE PROPOSITIONS that WILL benefit the sellers and buyers. Don’t just say that Exposure Creates Demand and Demand Drives Price, but know how to showcase the specific dramatic difference in the amount of exposure that you and your firm can deliver to attract more buyers. Be able to articulate HOW you are able to deliver a higher level of service, safety, and overall end result to them when they choose you as their agent/company. And be able to help the customer realize that there is a significant difference between agents and firms. If you can do that then there really is nothing to be afraid of. People demand VALUE… They demand SERVICE… And they demand RESULTS. These things are hard to deliver at a low COST. In the end and in closing, I believe there’s enough business for everyone. There is a market and a customer for every model. And what makes our country so great is that the customer is given choices. For me, I will always be a VALUE guy when it comes to large and very personal decisions that will affect my family. I drive a nice, safe, and expensive car, I seek out the best doctor, we have a great, but pricey family lawyer, I pay a little more for great insurance from a large company, and yes… I shop at Nordstrom almost exclusively because of their service. But I don’t fault those who choose the opposites of those to save money as that is a decision we all should be able to make for ourselves and options that should always be available for those who want them. One of the worst (and best) questions I get asked! So, it happens a lot… Probably the single most often asked question when I’m rolling out a new product or business growth strategy… “If I do this one new big thing, how much new business should I expect from it?” Along the same lines, this is just another twist on the same question “What does Mrs. TopAgent do to be so successful?” hoping that there’s one magical secret strategy that she’s discovered. Many of you know that my initial response to that question is “She works her &%$ off!” because it would take hours and hours to breakdown all of the things she does in a day, week, month, year, which by the way is why ongoing COACHING is so important too (Visit: https://bradpearsonsblog.com/2016/04/08/youre-paying-for-a-good-coach-whether-you-have-one-or-not/ ). Whether I’m talking about implementing an Expired Listing strategy, Social Media marketing, or a new product like our $20,000 Giveaway campaign, too often, agents get overly focused on the single tool or strategy and begin to dig, question, and even investigate other past results, to determine whether they should do it and whether it will work for them. The BIG problem with this thinking is that they aren’t focused on the bigger picture when it comes to growing a successful business. There is almost NEVER a single thing, strategy, or tool that has lead to any agent experiencing massive life changing success. A good example is a website. We all know that we absolutely MUST have one to be in the Real Estate business, yet I’ve NEVER met an agent who’s entire success can be attributed to a website, heck, I’ve never met one who can share with me any “direct” significantly measurable results from one. Yes, someone reading this will think, “I got a listing from my website once”, and again, that is missing the entire point and I would argue that something else you did, lead them to the website that actually lead to getting the lead. But without a solid over arching online strategy with print, networking, direct prospecting, testimonials, self promotion, open houses, door knocking, cold calling, notes, follow up, and good presentation skills, then the website would almost be worthless. The point I want to drive home in this post is that all we need to do is look at other super successful businesses and how they were built and grew in massive name recognition, reputation, and overall success. THEY ALL HAVE A SERIOUS UBIQUITOUS APPROACH TO MARKETING TO THEIR POTENTIAL CUSTOMERS. Take a business like McDonalds as an easy example. They’ve taken a very simple and focused business objective and continuously drive it out to the public so it reaches us from every direction. From billboards, TV, radio, bus benches, direct mail, strategic product or ad placement, newspaper, magazines/print media, social media, internet, etc. etc. etc. they are literally OMNIPRESENT in our lives. We couldn’t avoid McDonalds if we tried. Whether you eat there or not is not the question, but EVERYONE knows about them and knows what they’re business is all about. From a Realtor’s perspective, all we need to do is to continuously strive to be omnipresent in our farm areas, communities, and online. We need to continuously ask ourselves if what we are doing is reaching our prospective customers in enough ways to where they cannot avoid us and will think of us when they decide to buy or sell a home. So if you’re a master telemarketer, if that is all you do, you will burn yourself out from calling if you don’t have a solid strategy to grow your business organically from your past clients, local community, referral sources, online image, social media, direct mail/print, expireds, FSBO’s, etc. etc. Recognizing that all of these strategies, and any other strategies you decide to implement must OVERLAP with your other activities, IS the SECRET SAUCE to building a massively successful business! This is also why geographical farming works so well when everything an agent does is focused in a relatively small geographical area. Becoming ubiquitous is much easier when you pick 500 homes and 4 or 5 different strategies to get in front of them regularly! This is also why there are agents out there who have been mailing (and nothing else) for a year and have gotten nothing and are frustrated and discouraged. It takes much much more than that one thing. You’ve built the machine, the machine is delivering leads, now the leads need to me followed up on and nurtured until they result in a contract! You must have a great CRM program. 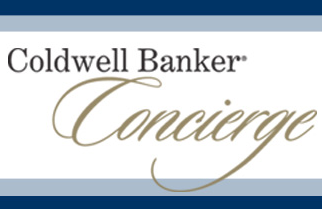 (At Coldwell Banker we provide a powerful one for free that covers online, print, mail, and pre-built/branded campaigns with email/text reminders so you can make your calls on schedule!). Thanks for visiting my blog and subscribe if you haven’t already! Why should a seller list with you? You’d better know! Ever since I received my Real Estate license in 1992 and started going on listing appointments, I’ve found three main types of home sellers and it’s not changed since then. 1. “I want the most money for my home and I don’t HAVE to sell.” 2. “I want the cheapest commission deal.” 3. “I don’t care about anything, I’m in trouble, get me out of here fast!” What’s great about this industry is that there is always a real estate agent who will meet the needs of each. What I’ve found though is that 1 & 2 are often very similar in their objectives and simply want to net the most money from the sale of their home that they can. They don’t want to leave any money on the table. In the case of “2” they see little value in what a Realtor can provide and they simply want to get into the MLS for the lowest possible cost and hope that the low commission will make up for any possible, but still unidentified, drawbacks of hiring the cheapest agent. And in very many cases, they never even considered the possible risks involved in hiring the cheapest Realtor. In my opinion… This is OUR fault as full service brokers/agents if we do not share with them in detail the benefits of listing with an agent/company with a well articulated and executed marketing and negotiating strategy. Now this is where YOU must know and be able to convey your UNIQUE VALUE PROPOSITIONS and how they will help you accomplish substantially better results in terms of terms, sales price, time, and even security. What I’ve found over the years as both a top producing listing agent and then in my leadership roles in large firms, is that a large portion of agents have/use no formal structured presentation and rather rely on their strength of personality, personal success and reputation, and sometimes luck, to win listings. While this works for many good agents most of the time, its the times when the seller prospect is interviewing multiple agents where the very expensive risk of losing the listing to a competitor who knows their UVP’s and how to articulate the potential financial benefits to them is a factor. This brings me to the point I hope I can get across in this post… Regardless of how good you are, or how great of a natural sales person you are, you MUST have and know how to clearly show your seller prospect WHAT the benefits of working with you are, HOW you can solve their problem (get them top dollar), and WHY they should choose you over a competitor! The VIEW Magazine – Single largest print and online real estate publication in Southern California with over 1.2 million distributed each month to subscribers of local newspapers! The VIEW Magazine CHINA- Printed, published and distributed within the Wall Street Journal in Beijing and Shanghai! Truly Global Reach – 710 Offices outside of the United States! 273 Offices in China! #1 in Southern California! #1 in the United States for closed volume! #1 on Social Media! #1 brand online! (Neilsen Ratings) #1 on YouTube! Proof that our strategies work in delivering exposure for our listings! #1 in Southern California in the $1,000,000+ price ranges! 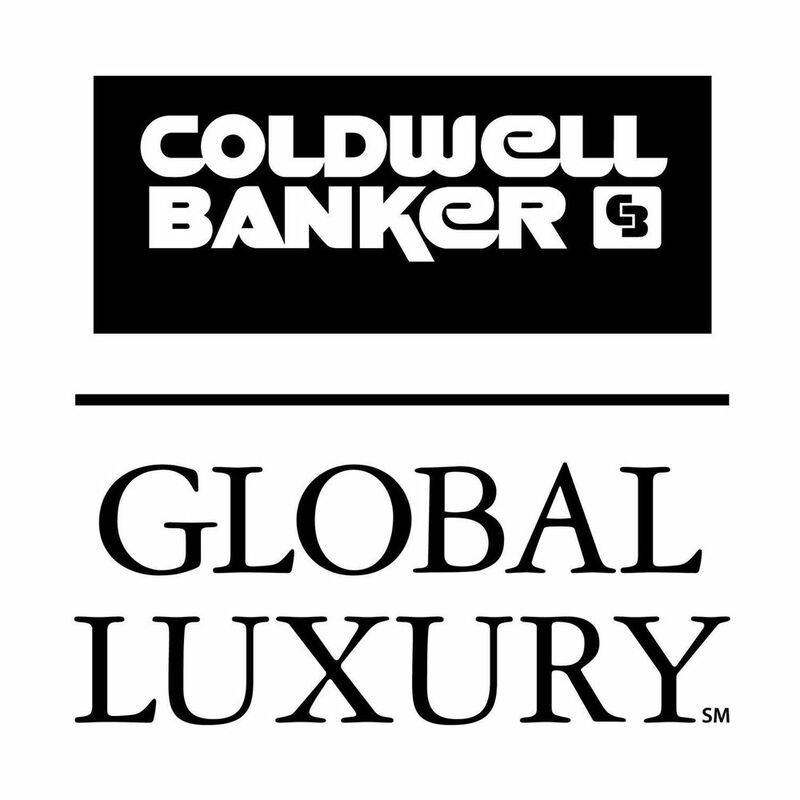 40+ million visitors from around the globe to ColdwellBanker.com and millions more to ColdwellBankerHomes.com. PreviewsAdvantage.com showcasing our luxury advantages! If you’re not with Coldwell Banker, then you probably should look into it, but either way, be sure to KNOW yours and your company’s UVP’s and be able to showcase how these will directly benefit your sellers if they list with you. Don’t wait until you lose a listing to learn them! As always, I’m happy to help and share ideas and strategies to grow your business and deliver exceptional service and results to your customers, so thanks for subscribing and have a great year winning! 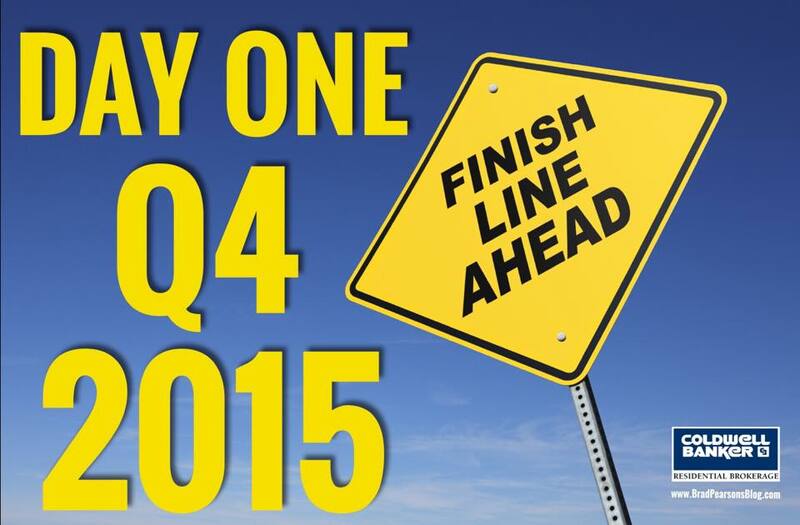 Day 1, Q4, 2015! Lot’s of opportunities! Today signifies the beginning of the last quarter of 2015. This is the time to step on the gas to ensure you end the year strong! Important numbers to recognize: Q4 2014 in Orange County there were 5998 properties sold, each of those had a buyer making almost 12,000 opportunities for a pay check! 6726 homes closed escrow delivering almost 13,500 actual pay checks to Realtors in OC! Listing inventory dropped from 7049 to 5190 (almost 30%!) during Q4 opening massive opportunities for those who work expired and cancelled listings and creating a lower inventory market for home sellers looking to capitalize on the opportunity to get more money for their homes and negotiate with SERIOUS buyers! Do you have a plan to make sure you capitalize on all of this opportunity to end 2015 strong and begin 2016 with momentum? While so many Realtors will be slowing down and talking about the market slowing down, YOU know the truth and must stay focused! If you’re not already with Coldwell Banker and enjoying all of the coaching, education, and marketing support we offer, then let’s talk! Click below for more information on this phenomenal firm! Get more listings with a simple sign rider and sell your listings faster! Sometimes in our business, it’s the most obvious things that are overlooked as the biggest opportunities for both Realtors and their clients. So many things in our industry are done only because that is what others do, or because what is believed as the right way, when in reality, so much of what is done in real estate now has become the absolute worst and in many cases the laziest ways of doing things. In this post, I plan to address one of the most ridiculous assumptions and most common mistakes Real Estate agents are making and how it could be hurting their clients. Let’s deal with some reality for a second… MOST buyers are moving from somewhere verses buying as an investment/rental, and the best qualified and most motivated buyers are those that are selling a home to either move up or move down from their current home. Yet, in our industry, the “contingent” buyer is the LAST buyer that many real estate agents would advise their clients to accept an offer from and frankly the term has become almost tabu. The overwhelming common belief is that a “contingent buyer” is the most risky. Even if the buyer/sellers current home is in escrow, many real estate agents will advise their sellers to take the non-contingent buyer even when they are going to pay CASH upon the closing of their home. This is a scenario that has perplexed me for years. I’ve preached a million times about what a ridiculous practice this is. This practice and belief is so deeply ingrained into real estate agents in our industry that regardless of the common sense and logic behind it, so many continue to push away these great buyers sending them back home discouraged and often causing them to just give up on the whole process. Let’s analyze this for a minute. EVERY single buyer is “contingent” upon one thing or another. Whether it’s financing, inspections, appraisal, etc. So the thought that any buyer is a lower or higher risk than another because they have a home to sell/close is ridiculous. In reality, the highest risk buyer is the buyer with the lowest MOTIVATION! All things being equal, a buyer who NEEDS to buy verses WANTS to buy is the one who is most likely to do whatever it takes to close. But even better is that the buyer who NEEDS to buy is almost ALWAYS willing to pay more and overlook small issues like inspections/repairs, and they are committed to closing the escrow on time! My contention and the reason for this post is that I would like to end the unfair pre-judgement of serious contingent buyers who simply have a home to sell or close since in reality, many of these buyers are not only good solid buyers, but the best buyers a seller could ask for in today’s market. 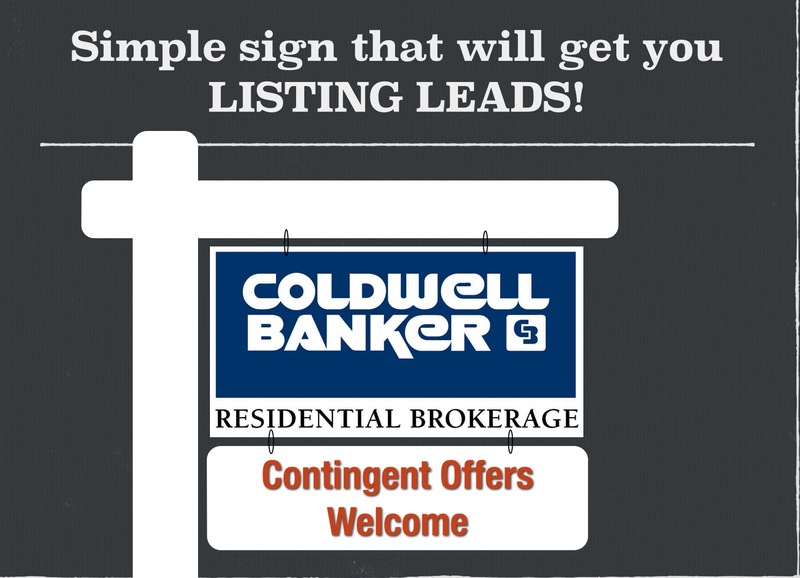 Now as promised in the headline of this post… A simple strategy to get more listings while helping sell your listings and do a great job for your sellers; JUST SIMPLY HANG A SIGN RIDER ON YOUR FOR SALE SIGN (AS WELL AS WRITE IN THE REMARKS IN THE MLS, “CONTINGENT OFFERS WELCOME”. This simple strategy will help prospective move up or move down home sellers to reach out to you and ask you about your offering. It will attract buyers (who have a home to sell) that have been turned down by many other sellers/agents to reach out to YOU to see your listing. Of course, you need to do your homework and make sure the buyers are qualified and they price their existing home within salable market value, but frankly that is the easy part. REMEMBER… The biggest fear for any seller is their ability to find a place to move to once they sell their home. As Realtors, whenever we can provide a solution to that problem, everything else becomes secondary and so on. By offering your listings to contingent buyers, you help solve the problem and this will get you listings! I’d even go so far as to become and signify on my marketing that I am a “Contingent Buyer Specialist”! Now how many of you would be opposed to taking a new listing and selling them your listing, contingent? I doubt anyone.